Ok...it's confession time for me! I "may" have a slight issue (read: major problem) with hoarding! I know, I know...it's such an unheard of problem in the stamping community right? LOL! Come on, I KNOW I can't be alone!! Well, I decided that my wonderful and much loved supplies aren't doing me any good sitting in drawers! So, today I decided that not only am I going to actually USE them (GASP! :-), but I was going to use my most favorite ones first! October Afternoon patterned paper (Cherry Hill), Cupcake chipboard, sparkle, rhinestones...these are all very high on my most treasured list! :-) I even used my favorite Taylored Expressions stamp set - Sprinkled With Love! Here's a close-up of the chipboard cupcake and tag! I have to to tell you...when I first "discovered" chipboard I was so excited about it! I bought lots of it...then it sat in my craft room collecting dust because I wasn't sure what to do with it! LOL! Now that I know how EASY it is to use, I can't get enough of it! :-) You can paint it with acrylic paint (like I did with the cupcake top), cover it with solid or patterned paper (like I did on the cherry, heart, and cupcake bottom), or you can even leave it plain! Anyway you decide to use it, chipboard is fun way to add that "special something" to your projects! Paper: Choice Buttercream c.s., October Afternoon patterned paper (Cherry Hill), Kraft c.s., Berry Sorbet c.s. What a great card! I love the DP...will definately have to try and get some for my own stash. Thanks for sharing your favorites with us. What a great post and GREAT cupcake card. Thanks so much for the dose of encouragement to use chipboard. I love it but am too chicken to even buy it. I even have all the distres crackle paints but no chipboard. Pretty pathetic of me, huh? Anyway, I adore your cupcake card. Cute, cute, cute! I have a drawer full of chipboard just waiting to be loved...thanks for encouraging me! 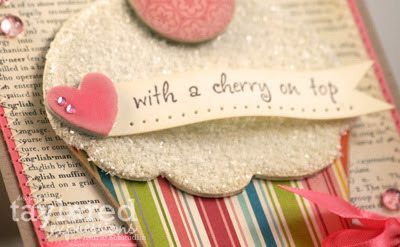 so very cute, love the papers, great background and love the pattern for the cherry! Such a sweet card, Laurie! Fabulous Laurie! 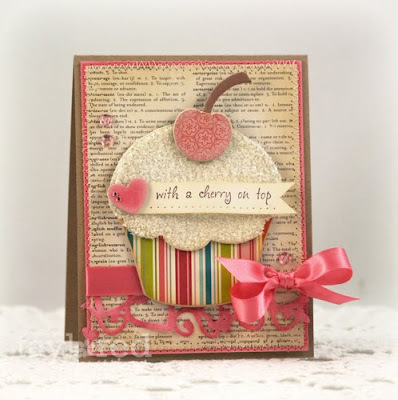 Love your frosty cupcake and great ideas for chipboard. I have a "few" pieces that I have been hoarding LOL! This is SO pretty! I need to dust off my chipboard...I did the same thing, bought a ton and stored it, lol! I love the soft yet sparkly look of this! This is so stunning! Love that cupcake and the glitter is simply so sweet! This is such a FANTASTIC card - perhaps because you used so many of your favorite things! I am a bit of a hoarder too - but am getting better!